The November 14 issue of The Week listed three web sites where you can take a test or survey that supposedly tells you about yourself. I like these kinds of things so I visited each site and took their tests. After yesterday's rant about how my workplace's mission and vision statement is no different than Albert Einstein's definition of insanity (which I still believe is accurate), I was wondering if this anger and frustration would evidence itself through the results of the tests. Here's the first test, which measures how "sane" a person is. It can be found at www.sanityscore.com. Click on the image for a larger version. I think they are right about me having technology issues, meaning I spend too much time on the computer. I don't know what they mean about mania since there's no explanation or elaboration. This was a pretty straightforward test with what I thought were obvious questions as far as what they were attempting to measure. 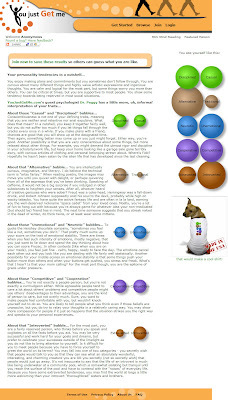 The next test, found at www.youjustgetme.com was more interesting. The novelty about this site is you can do a self-assessment, save your results, then have your friends visit the site to not only peform their own self-assessments, but answer the same questions as they pertain to you. Then you can compare how your friends view you versus how you view yourself. Here is how my results came out (again, click the image for a larger version). I'd say overall it was pretty accurate except the part where it says it wouldn't be surprising if I indulged in other substances to heighten my experiences. That I absolutely do not do, and don't condone. Why should I? I'm crazy enough as it is, haha.. Finally, here are the results of testing done at www.implicit.harvard.edu/implicit. 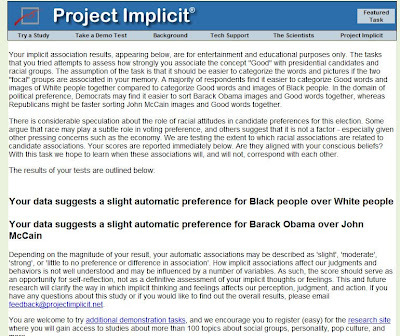 This was a more unusual test designed to see if a person favors black over white people, or Obama over McCain (or vice versa). I was kind of surprised at the results, since I don't feel I lean toward either race, and I voted for McCain. But I guess growing up in the 'hood must have had some effect on how I handled the test! Again, click the image for a larger version. Actually, for a good portion of my life I actually didn't like black people. My elementary school was about 98% or more black; junior high was about 90% and high school a little less, but in all cases the ethnic composition was mainly black. Early in elementary school I was teased a lot - kids would call me a "ching-chong Chinaman" or "jap" and then pull their eyes back to make them slanty, or imitate Asian speech in a derogatory manner. I hated it. I used to wish I were black like them just so I'd be a part of the group. Later on I used to tell myself I was glad I wasn't black, and would look down on them, thinking how stupid I had been to have wished I was black. Being a substitute teacher for a while didn't make it any better because I'd focus on all the negative aspects I could find about the black kids in the classroom. Since the highest rate of absenteeism in the district was in the south central sector, that's where I registered, and where most of the kids at that time were black. On the other hand, my three best friends at Foshay were black, and I had lots of other black friends as well. How did that make any sense in light of the way I felt? It didn't, so I glossed over it. Later on in life I had to admit to myself that it doesn't matter what race or ethnicity someone is, we're all on the bell curve of being humans. No race has cornered the market either for being "good" or "bad." That last paragraph might sound obvious to you, but for me, I had to reconcile feelings and tendencies within myself to keep trying to categorize and rank people based on their race. Finally, there were just too many inconsistencies in the models I tried to construct and no longer could I keep trying to justify or rationalize this idea that blacks were inferior or had negative characteristics peculiar to their "own kind." I doubt that anyone today would accuse me of being anywhere near a racist; in fact they would say I am just the opposite. But that wasn't always the case. I'm just thankful that finally I saw the light and admitted I couldn't keep justifying my biased and racist attitudes. And thus ends today's couch session.. if you have time though, try those tests and see what you think.